BRUSSELS — Three people were killed and one seriously injured in a spree of gunfire at the Jewish Museum in Brussels on Saturday, officials said. Police detained one suspect who was at the scene and are looking for a second. The attack, which came on the eve of national and European Parliament elections, led officials to immediately raise anti-terror measures. 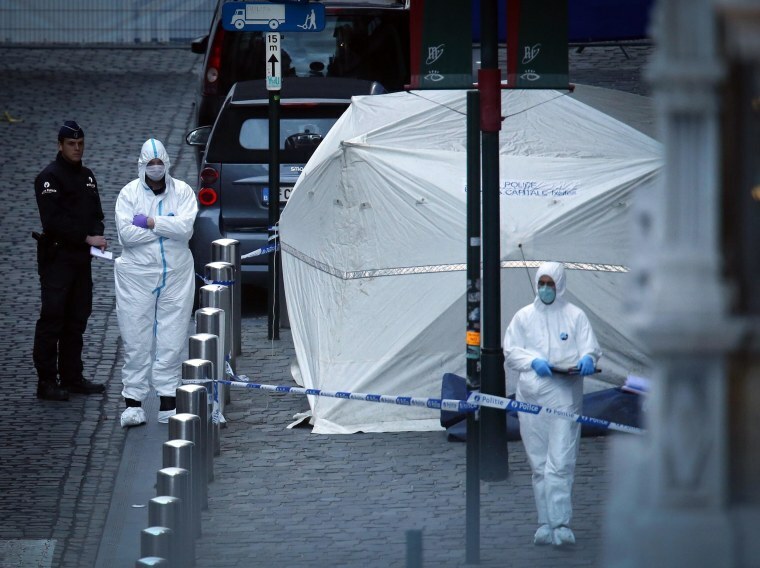 Belgian Foreign Minister Didier Reynders, who was in the vicinity, said the scene "was terrible and left me shocked" as he saw two of the three dead lying at the entrance of the museum, located in the swanky Sablon neighborhood. Reynders added that "you cannot help to think that when we see a Jewish museum, you think of an anti-Semitic act. But the investigation will have to show the causes." Interior Minister Joelle Milquet told reporters that the shooter apparently parked a car outside before entering the Jewish Museum. She added the gunman "apparently fired rather quickly, went outside and left." The three dead were two women and a man, and they were hit by bullets in the throat and face, said Ine Van Wymersch, spokeswoman for the prosecutor's office. No further details were given. Van Wymersch said one suspect was detained after he drove away from the museum around the time of the attack. A second person suspected of being implicated apparently walked away from the scene. Milquet said anti-terror measures were immediately heightened. "We decided to apply to a maximum level of protection to Jewish sites," she said. Prime Minister Elio Di Rupo expressed support for the Jewish community. "All Belgians are united," he said. European Jewish Congress President Moshe Kantor said that, even though it has yet to be established whether the attack was anti-Semitic, "we are acutely aware of the permanent threat to Jewish targets in Belgium and across the whole of Europe." "European government must send out a clear message of zero tolerance toward any manifestation of anti-Semitism," Kantor said in a statement.